None recorded in the Typed Inventory. Probably old Tower collection; in the collection by at least 1916. 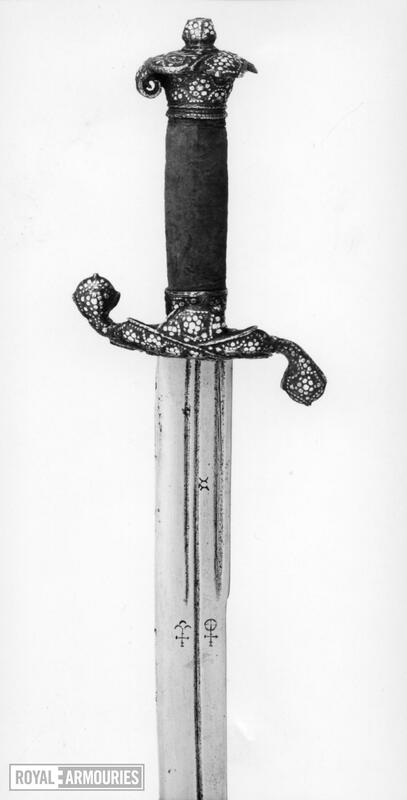 Blackened iron hilt decorated with silver encrusted patterns of dots, and consisting of a mushroom-like pommel cap scrolled towards fore quillon, and with button and shell-guard made in one with short quillons recurved in the ane of the blade; a short ferrule on the end of the grip nearer the blade. The shell-guard is formed as if of three interlaced ribbon ends, and the decoration of the pommel cap echoes this design. Modern, velvet-covered grip. 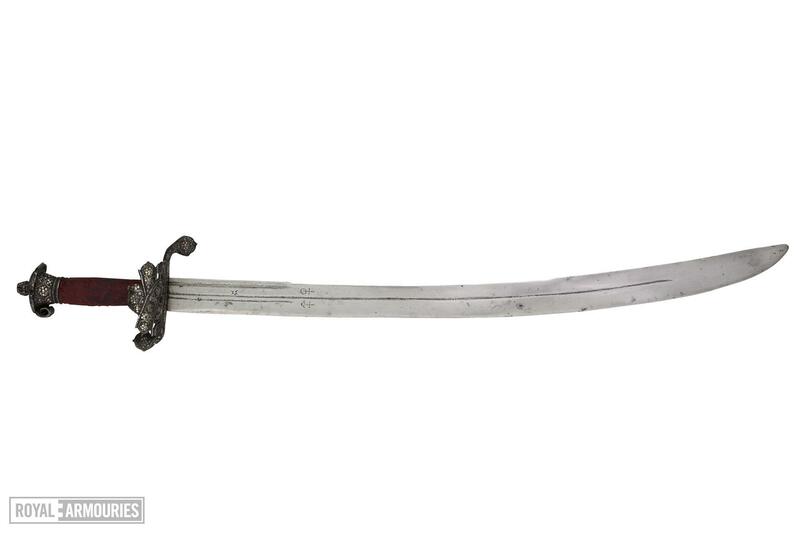 The curved, single-edged blade has a single long fuller and a short one nearer the hilt. On blade, on each face, stamped (composite struck? ): a mark comprising a circle with a semi-circle on each side (open sides out) (a maker's mark? ); stamped (composite struck) and inlaid in copper (part missing): an orb surmounted by a cross and three semi-circles (two and one) surmounted by a cross (possibly religious symbols) (drawings on Marks Cards in Curators' office; repr. Dufty and Borg 1974, Pl. 109). Charles ffoulkes, Inventory and Survey of the Armouries of the Tower of London, 2 vols, London, 1916, II, p. 282 (ills. 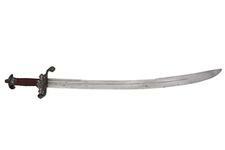 of hilt and top of blade, and of two marks) - described as a 'falchion' of mid 16th century. A.R. 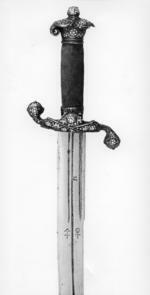 Dufty and A. Borg, European Swords and Daggers in the Tower of London, London, 1974, p. 25, 'English, c. 1630'. Pls 55c (hilt and top of blade), 109 (marks on blade). Dorling Kindersley, Weapon. A visual history of arms & armour, Dorling Kindersley Ltd, London, 2006, p. 116 (col. illus., right). Display label in (Tower) Hunting & Sporting Gallery (to 1991), 'c. 1640'. The same combination of religious(?) symbols occurs on the blade of the hanger, IX.942.